Three MWSA reviewers will read and score your book (one of whom will write a review). 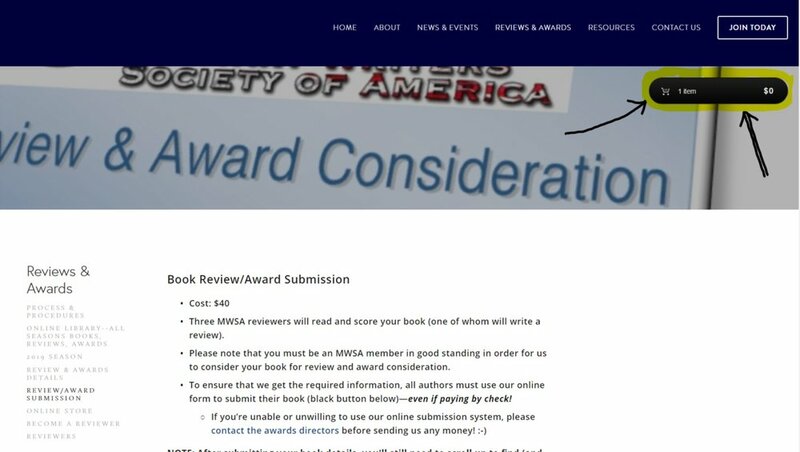 Please note that you must be an MWSA member in good standing in order for us to consider your book for review and award consideration. To ensure that we get the required information, all authors must use our online form to submit their book (black button below)—even if paying by check! After submitting your book details, you'll still need to scroll up to find (and click on) the "shopping cart"--normally located near the top right of the screen. Your transaction will not complete until filling out and submitting both the book details and payment forms. You must fill out the payment form even if you'll be mailing in your check separately. Warning! Paying via check will delay your book submission until your check for $40 is received and credited to our account. Payment must be RECEIVED on or before June 15th to have your book reviewed or considered for award in the current year. please make sure you’ve completed your submission! After submitting your book information, please scroll up and look for your Shopping Cart. Click on that button to complete your book submission! By clicking on the "Purchase Review" button above, you're acknowledging that you've read the "Reviews Process & Procedures" and "Details" pages!